Yellowfin tuna, cane sugar, tapioca maltodextrin, sorbitol, soy sauce powder, sea salt, yeast extract, contains 2% or less of natural flavor, ascorbic acid, onion powder, spice. The first flavor I pick up is a lightly sweet, tuna fish flavor. A touch of salt comes in, developing more into a light soy sauce. The chewing brings on a more defined tuna sashimi flavor. For being sold as a "Sweet" variety, it seems to hold up. The sweet is noticeable right off the bat, and continues through most of the chewing. But it doesn't overpower, and allows the other flavors to show through. 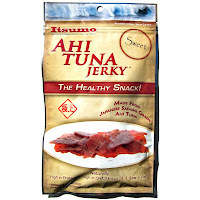 Otherwise, the primary taste profile is a tuna sashimi flavor, with a light soy sauce, and a fair amount of sweet. The tuna initially has a slightly soapy, or mustard-like character, perhaps something comparable to horseradish, but becomes less noticeable after eating several pieces. The meat consistency looks good, with a fair number of sashimi-sized pieces, but well out-numbered by small bits and oddly shaped cuts. It's not oily or sticky, but rather dry to the touch. It doesn't leave any fishy smell on my fingers, nor waft any offending odors throughout the room. It's initially chewy, requiring a fair amount of effort before chewing down into something more soft. 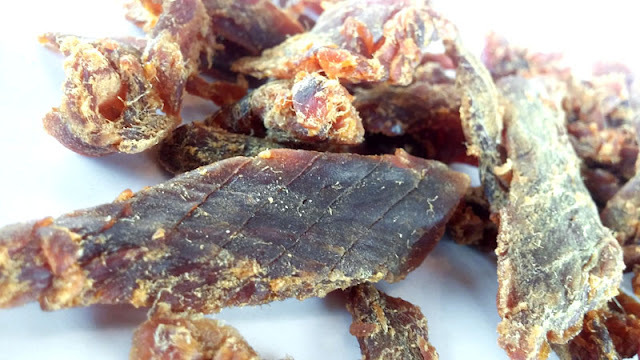 Once chewed down, it feels something comparable to sashimi, just more chewy, and even something similar to turkey jerky. 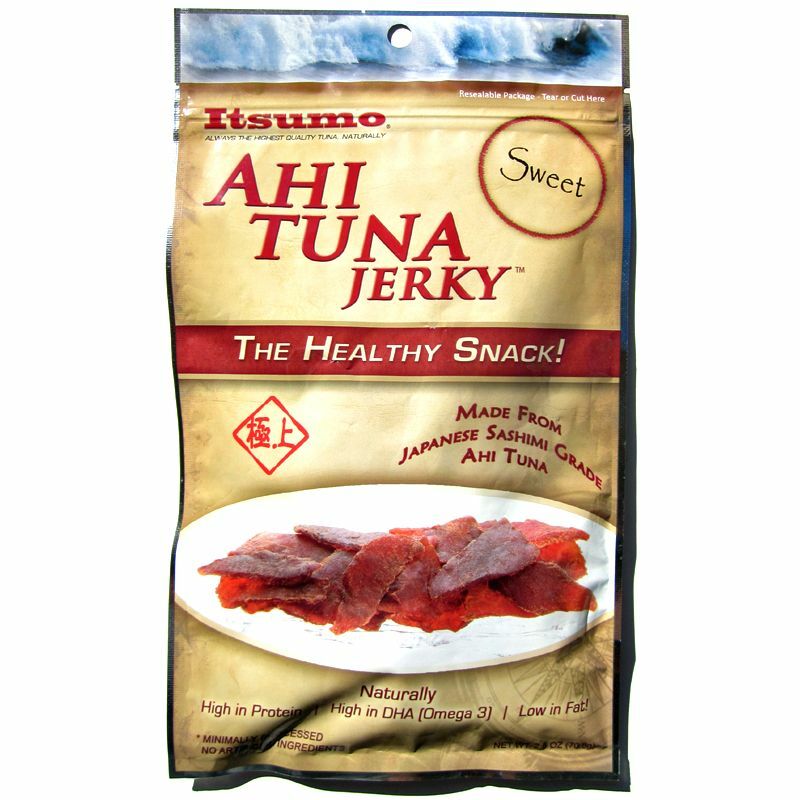 This Sweet variety from Itsumo Ahi Tuna Jerky manages to deliver a mild, but noticeably sweet flavor that mimics the taste of tuna sashimi, dipped in soy sauce, with a touch of wasabi. The first few pieces offered a flavor clearly unlike anything found in beef jerky, or other land mammal, but afterwards it grew on me and I found it quite snackable. If you're looking for something that recreates the flavor and experience of tuna sashimi at a sushi-bar, this will give you some of that, but that's not what this snack is about. This is more about getting the benefits of eating tuna, such as the Omega 3's, the high protein, and the low fat, without having to open up a smelly can, or the sticky handling of smoked fish. If you look at it that way, Itsumo is awesome. 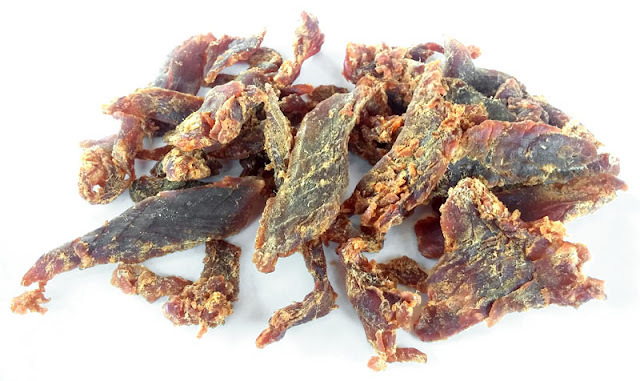 For just good old fashioned jerky aficionados, it's definitely a great achievement as far as jerking raw fish. If you love beef, bison, elk, and other red meat jerky, this ahi tuna may throw you back at first. But give it a chance to convince you, and you find yourself liking it.